Verfasst von pw am So, 03/16/2014 - 14:00. Providing a comprehensive survey of cutting edge scholarship in the field of German--Indian and South Asian Studies, the book looks at the history of German--Indian relations in the spheres of culture, politics, and intellectual life. Combining transnational, post-colonial, and comparative approaches, it includes the entire twentieth century, from the First World War and Weimar Republic to the Third Reich and Cold War era. The book first examines the ways in which nineteenth-century "Indomania" figured in the creation of both German national identity and modern German scholarship on the Orient, and it illustrates how German encounters with India in the Imperial era alternately destabilized and reinforced the orientalist, capitalist, and nationalist underpinnings of German modernity. Contributors discuss the full range of German responses to India, and South Asian perceptions of Germany against the backdrop of war and socio-political revolution, as well as the Third Reich's ambivalent perceptions of India in the context of racism, religion, and occultism. The book concludes by exploring German--Indian relations in the era of decolonization and the Cold War. JOANNE MIYANG CHO is Professor of History at William Paterson University of New Jersey, USA. Profile page. ERIC KURLANDER is Professor of Modern European History at Stetson University, USA. Profile page. DOUGLAS T. MCGETCHIN is Associate Professor of History at Florida Atlantic University, USA. Profile page. Cho, Joanne Miyang, Eric Kurlander, Douglas T. McGetchin (2014). 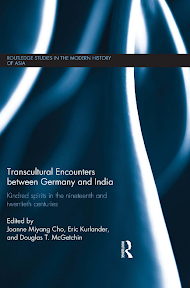 Transcultural Encounters between Germany and India: Kindred Spirits in the 19th and 20th Centuries. Routledge studies in the modern history of Asia; 90. xvi, 238 S.